According to national estimates, stroke is the third leading cause of death among women in the United States, and the aftermath of these events is significant among survivors. Studies have found that about one-third of women who survive a stroke will need help caring for themselves, whereas 16% will require institutional care, and 7% will have an impaired ability to work. Each year, about 55,000 more women than men will have a stroke. There has also been a rise in stroke prevalence among middle-aged women that has not been seen in their male counterparts, highlighting the need for a better understanding of stroke among women of all ages. To improve outcomes and reduce disparities, it is important to address gaps in women’s knowledge as it relates to stroke warning signs. In 2012, the American Heart Association (AHA) commissioned a national survey to determine women’s cardiovascular disease awareness. This survey also included an assessment of knowledge relating to stroke warning signs. For a study published in Stroke, Dr. Mochari-Greenberger and colleagues evaluated the knowledge of stroke warning signs and intent to call 9-1-1 first if warning signs occurred. The analysis included more than 1,200 women aged 25 and older from various races and ethnicities. According to the results, only about half of women surveyed could identify sudden weakness or numbness of the face or a limb on one side as a stroke warning sign (Figure). A little more than 40% of women identified that loss of or having trouble with talking or understanding speech was a stroke warning sign. This occurred more frequently among Caucasian women than those of Hispanic descent (Table 1). Fewer than 25% of women identified sudden severe headache, unexplained dizziness, or sudden dimness or loss of vision as warning signs. 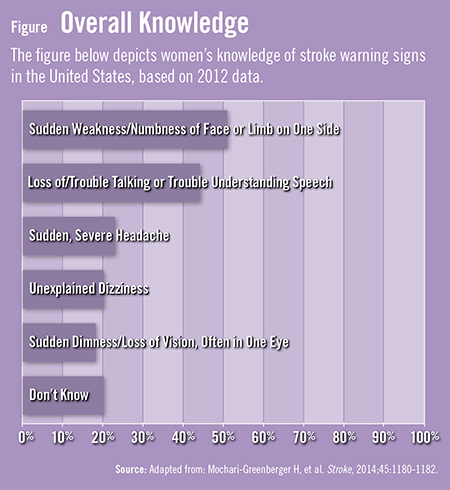 “One in five women was unable to identify a single stroke warning sign,” adds Dr. Mochari-Greenberger. Patient education efforts for women are warranted, according to Dr. Mochari-Greenberger. “Several public awareness campaigns have been launched,” she says. “For example, the AHA and the American Stroke Association have issued the Spot a Stroke FAST campaign. The word FAST is an acronym for the groupings of warning signs, which include face drooping, arm weakness, speech difficulty, and time to call 9-1-1. The hope is that more efforts like this will reach diverse groups of women in the future. In the meantime, clinicians should engage their female patients with any risk factors for stroke about their knowledge of stroke warning signs.” Having an open conversation about it could mean the difference between life and death. Mochari-Greenberger H, Towfighi A, Mosca L. National women’s knowledge of stroke warning signs, overall and by race/ethnic group. Stroke. 2014;45:1180-1182. Available at: https://stroke.ahajournals.org/content/45/4/1180.full. Mosca L, Hammond G, Mochari-Greenberger H, Rao S, Albert MA. Fifteen-year trends in awareness of heart disease in women: results of a 2012 American Heart Association national survey. Circulation. 2013;127:1254-1263. Centers for Disease Control and Prevention (CDC). Disparities in deaths from stroke among persons aged < 75 years: United States 2002. MMWR Morb Mortal Wkly Rep. 2005;54:477-481. Ferris A, Robertson RM, Fabunmi R, Mosca L; American Heart Association; American Stroke Association. American Heart Association and American Stroke Association national survey of stroke risk awareness among women. Circulation. 2005;111:1321-1326. Cruz-Flores S, Rabinstein A, Biller J, et al. Race-ethnic disparities in stroke care: the American experience: a statement for healthcare professionals from the American Heart Association/American Stroke Association. Stroke. 2011;42:2091-2116. Heidi Mochari-Greenberger, PhD, MPH has indicated to Physician’s Weekly that she has or has had no financial interests to report. Do EMRs Make Documentation Too Easy?